I am nervous. There. I said it. Actually, I was nervous the entire book. Nervous and scared, excited and fired up, flustered and eager…and so damn hopeful. My heart is heavy and raw. My eyes are dry, but only because I finished the final page days ago. Frankly, I’m exhausted, emotionally beat down. And I think you should join me. Ha! Seriously, misery loves company, right? Let me tell you why I’m suggesting that you sign yourself up for this story with an extra-large box of Kleenex. This book isn’t perfect. But our lives are filled with wonderful less-than-perfect gifts. This book isn’t easy. But some of the greatest books demand a fight uphill to get…there. This book isn’t all gloom & doom. Even in the face of despair, smiles shine and love blooms. 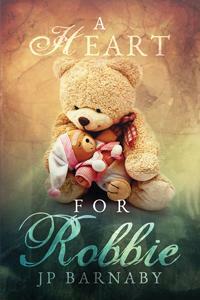 It is about baby Robbie, it is about family, and it is about hope. I told you my heart was heavy, yes? Well, because it is loaded with hope. The blurb is very well written, it effectively sums up the storyline. However, it is so much more than a father’s fight for his son’s survival. Multiple facets kept it going. You are guaranteed to stir up lots of feelz, for it was overflowing with them. Being a mother myself, I could close my eyes and imagine switching places with Julian. I felt his pain, his desperation, and his fear. I believe the emotions are displayed with such clarity even if you are not part of the mom and dad club, it won’t make much difference. That alone is one of the many reasons I think you should experience this powerful journey. Julian is a strong, successful man. A seasoned author with a head full of talking voices. We all know money does not buy happiness and Julian has been burned by false promises before. He confronts his loneliness head-on and accepts that his happily-ever-after isn’t going to appear gift-wrapped on his doorstep. If he wants it, he must go get it. Someone to love and someone to reciprocate….that’s what he wants, what he needs. His family supports his decision to become a father and his best friend surrogates a child to fill the void in his life. Little did he know when a child is born, so is a parent. Parents lose the safekeeping of their own heart, no longer is it protected and secure…but if you ask any parent, it’s a risk worth taking. Robbie is born and in an instant his elation turns to desolation. No heart lacks the strength to break another. This precious blessing holds immense powers and can forever change his future. Julian, Robbie and Simon…I simply loved every one. Strong characters tied together with deep emotions negate any complaints I might have had. I could have done without the prologue and I was less than thrilled with Simon’s mother. My emotions were strung so tight, I didn’t need the added layer of disgust with the homophobic mom. I understand she had an important role in the capsizing of Simon’s life, but that doesn’t mean I had to like it (or her for that matter). Some things weren’t exactly necessary, so I merely grazed over those moments and focused on the essentials. The tender bonding and the fierce need between Julian and Simon balanced the hardships. Impressive, intense and the epilogue made every tear shed….worth it. This entry was posted on July 16, 2014 by BioB in Contemporary, Reviewer: Sheri and tagged 4 Stars, dreamspinner, jp barnaby.